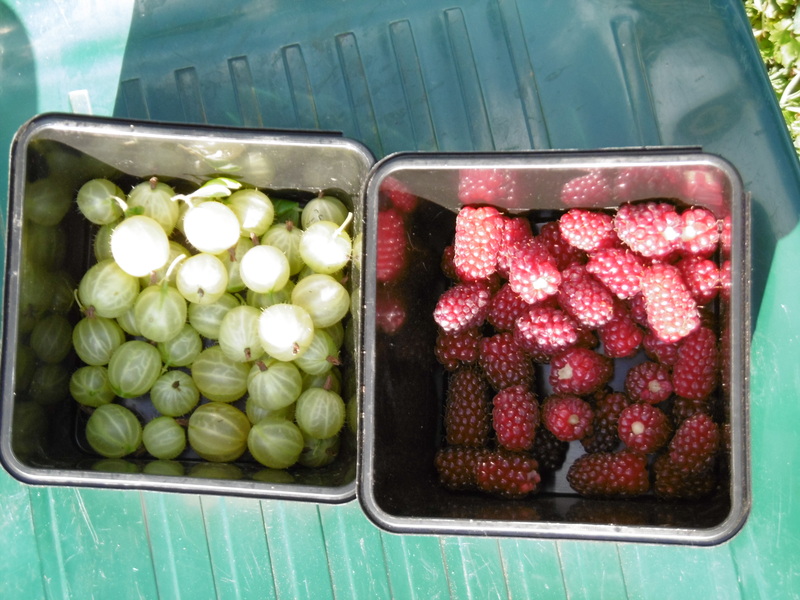 It’s that time of the year when the soft fruit is ripening, and there’s an almost daily supply of fresh loganberries (a cross between a raspberry & a blackberry) and gooseberries, it’s one of my favourite times on the allotment. Last night I made loganberry ice cream, and tonight I’ll be making gooseberry ice cream. Tomorrow, there will probably be more to make something else with. I suppose given the inaccurate science of weather forecasting I shouldn’t be surprised, but six inches deep water sloshing around the back door, and across our garden in less than a minute was pretty spectacular and frightening, but at least I won’t have to water this evening! This entry was posted in Garden / Allotment and tagged allotment, gooseberries, gooseberry, loganberries, loganberry, rain. Bookmark the permalink. Those berries look delicious, Alan! So nice to see you harvesting some “fruits” of your labour. We haven’t had all that great for weather, either. Rain, thunderstorms and lots of wind. We haven’t had to water the garden, but the plants are sure taking a beating. Although, they are surviving, thankfully. It can be quite unsettling to see that amount of rain come down in such a short time. Glad it didn’t last too long and you did not get flooded out. Hi David, I haven’t had to water for a while either, apart from some of the seedlings that are coming up and they also seemed to have survived the heavy rains, at least this time! It sure is – plenty to harvest and eat!